It may come as a surprise to some that the very same occult foundation of National Socialism (Nazism) exists today, and is indeed an important part of the fabric of the Alt. Right and modern National Socialists. The legacy of the Alt Right variety of esotericism is due to the efforts of several occult "Identitarian" philosophers, including in no small part a woman known as Savitri Devi. Savitri wasn't German as one might expect of such an ardent Nazi (and she indeed was), but of French, Greek and English parentage. She had become obsessed with the National Socialist Party in the late 1920's as well as the Indo-European myth of colonization of India. She moved to India to immerse herself in the culture, which she saw as the earliest manifestation of Hitler's Aryan race and the potential model for the coming Aryan "Golden Age". She viewed the most rigid application of the caste system as being the natural manifestation of Aryan survival and the height of its culture. She spent the entirety of the reign of the Third Reich and of World War II in India hoping for an Axis victory, after which she and her Brahmin husband (more on him to follow) hoped to assist in the establishment of a racially pure National Socialist subcontinent. 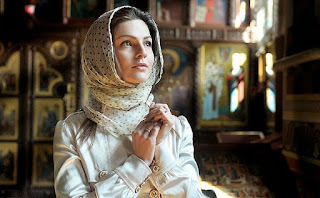 During these years she developed her own peculiar religion. 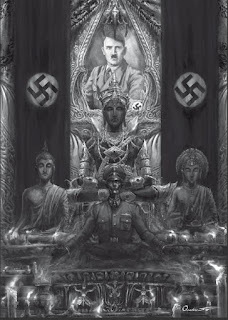 In essence the cult she developed is very much akin to Theosophy, being a synthesis of Hinduism, Nordic mythology, and National Socialist racial theory that also included the mythological polar origin of the Aryan race, the Vedic cyclical view of human history, and the centrality of the incarnation of Kalki, of whom she viewed Hitler to have been an avatar. She regarded the Third Reich as “the holy land of the west, the stronghold of regenerate Aryanism.” Oddly enough, this virulent racist married Dr. Asit Krishna Mukherji, perhaps India's only true National Socialist. Mukherji was well versed in National Socialist philosophy and political theory, and from 1935-1937 he published the pro-National Socialist paper “The New Mercury”. Mukherji openly praised the Thule Society and it's influence on National Socialism and may have helped his wife form many of her mystical ideas. Savitri began writing a book on the Pharaoh Akhenaton during the war years, and even chose him as her personal deity to whom she rendered worship. Eventually she developed her own trinitarian divinity which included the Pharaoh, Genghis Khan, and Adolf Hitler. Savitri might have simply faded into the shadows of a terrible neo-Nazi history if not for the work of Holocaust Revisionist Ernst Zundel. In 1982, Zundel published and promoted Savitri Devi and her teachings. Her writings promoted a National Socialist metaphysical worldview that encompassed her strange mystical ideas and connections between Hitler and Akhenaten, animal rights, and “Green” ideology (with a decidedly National Socialist slant), vegetarianism, and as noted earlier, Hitler as the avatar Kalki. Kalki is a Hindu deity and an avatar of Vishnu, who is believed to be the final coming avatar who will destroy confusion and ignorance. Interestingly, Savitri stated that the only problem with this avatar was that he was too compassionate. In other words, in her view Hitler should have been more brutal. 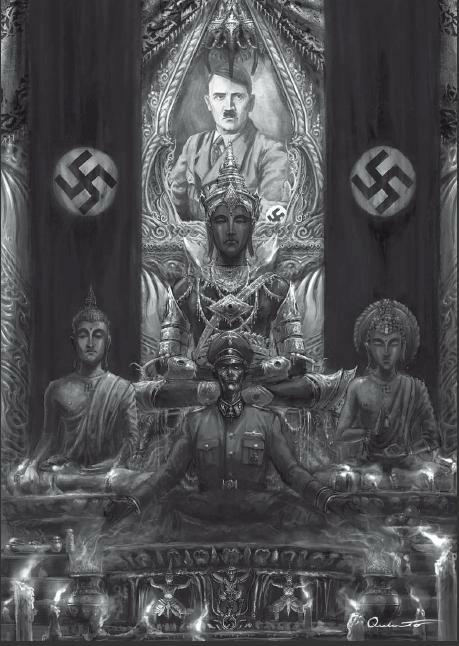 Essentially, she built around Hitler a mythological tapestry drawing on a variety of religious symbols that appealed not only to racist groups, but some sections of the New Age Movement, particularly those dedicated to traditional Theosophy. Her ideas actually do much to reveal the deep shared connections between the spiritual background from which National Socialism sprang and the New Age Movement. Oddly enough, much like Hitler, she demonstrated a special love for animals, while exhibiting contempt for “non-Aryan” humanity, the weak, and the handicapped. She shares this in common with Himmler and Alfred Rosenberg as well, both of whom loved animals but viewed segments of human society as “unworthy of human life.” Interestingly, this occult approach to human life has never gone away, but is alive and enjoying immense popularity among adherents of the Alt Right. Such was her cold concern for fellow human beings that animals were considered of more value in her philosophy. Her book “The Impeachment of Man” (1959) was a manifesto against the Judeo-Christian worldview. In fact, she actively worked as an “anti-missionary” in India. She toured tribal villages and engaged in arranged debates with Christian missionaries and was reportedly very successful in her efforts to keep people from converting to Christianity. This was not because she held some deep conviction of the truth of Hinduism, but more a reflection of her hatred for Christianity as a "Jewish religion", and really as an act of deception. Commenting on this she said, “From the racist Aryan viewpoint, it was necessary to give the most backward and degenerate aborigines a false Hindu consciousness.” For her, keeping these people Hindu meant that they would eventually be easily assimilated into a National Socialist society as a slave class. A repugnant opinion at best. She eventually took to traveling across Europe, speaking at gatherings of various racist groups, including National Socialists, extolling the virtues of “Aryan purity”, dedication to Hitler as the “man against time” (a phrase denoting his divine authority to defy the ages), and the Nazi mantra of “blood and soil”. Finally in 1982 this priestess of the Black Sun died in the home of a friend preparing for a speaking tour of National Socialist groups in America. But this was not to be the end of the racial paganism for which she was an apostle. It would continue to grow and gather followers, only the imagery would change. While few in the Alt Right are outright National Socialists, the paganism of Savitri Devi continues to exist in different forms, and has had other voices added to it. 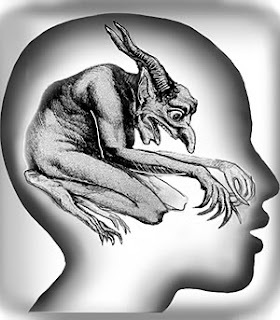 Such esotericists as Miguel Serrano, Julius Evola, and Alain de Benoit continue to add philosophical fuel to the movement, which means that, just as its predecessor-National Socialism- it is essentially a pagan/occult worldview. Christians can have no association with such a worldview, not only because we reject occultism, but because we understand that in Christ "there is neither Jew nor Gentile" (Galatians 3:28), and thus racist views and politics are antithetical to our faith and an insult to our Jewish Savior.